The trip was glorious and exciting beyond expectations. Standing on the same ground as so many early Christians, and seeing the relics of so many of these Christians and martyrs was at times simply overwhelming. The trip was a well-organized group tour. However, in addition to the planned tours, several of us made efforts to immerse ourselves in the local culture. Each evening we ventured out and walked the towns. We enjoyed gelato, espresso, and other local foods and beverages. We took in local festivals and parades. Sleep? That's something best left for when we returned home. In Italy, wine rules and we enjoyed local wines with every dinner. As far as beer goes, Italy is a land of lagers. I read about a few artisanal Italian beers before the trip, however I did not run across them while there. Granted, no extreme effort was expended in the search. There was just too much good wine readily available. Any beer I had in Italy was accompanied by a quick lunch, or alone as a refresher between meals. 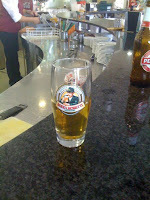 The most common beers I saw in shops and cafés were Heineken and Becks. I didn't bother with those, though it was apparent they were popular with the local folks. 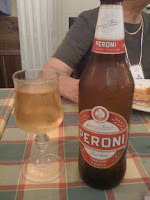 The most commonly offered Italian beers we saw were Peroni and Birra Moretti. Both of these pale lagers are available in the U.S. but I don't think I've ever tried them before. They were as expected, mild and drinkable. Served cold, these beers are refreshing, but at first un-exciting to an American palate more accustomed to bolder "American" flavors. But they aren't horrible either. I didn't experience any "skunky" flavors one often finds with pale lagers in America. Of course, these beers had not been shipped across the ocean either! 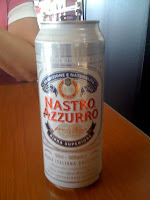 Nastro Azzuro was another new beer for me. This is a another Peroni product. I purchased a Nastro in a 50 cl can during a roadside stop for lunch. Of the Italian beers, the Peroni drafts I had at a sidewalk café in the Borgo Pio in Rome, with anchovy pizza for lunch, were the most enjoyable. One other beer I had in Italy was actually an import from Denmark, Ceres Strong Ale. This one seemed to be offered widely, especially in Rome. I grabbed a bottle at a small market down the street from our hotel and enjoyed it right from the bottle. The 7.7% ABV gave this lager a bit stronger flavor that the other european-style lagers. None of the beers were typical of beers I generally drink. However, they are the beers consumed by the majority of Italian beer drinkers. Pale lagers for sure, but lagers with flavor. Whether it was related to being in Italy or not, I found them more pleasing that the mass produced lagers consumed by the majority of American beer drinkers. After I returned home, I looked up these beers online. As I expected many of the ratings were low, but not reflective of my impressions of these lagers, and the overall experience of drinking beer in Italy. While we were in Italy I also tried for the first time Grappa and Limoncello. Grappa is made from the leftover grape pressings from the wine making process. It's clear, strong, and will quickly open up your sinuses. I consider it one of those "must try while in Italy" experiences. (Okay, that's done.) Limoncello is a much more pleasant drink. Like grappa, it's served as an after dinner digestivo. It's served chilled and is surprisingly refreshing. Following Italy, we traveled to Malta. My beer experiences there were both interesting and unexpected. I'll tell you about that soon.